← Patio Table is Done! We have a new neighbor across the street and I’ve been commissioned to build a door. It will be made of Cherry with tempered glass in the upper section. With an over-all the size of 56″ wide and 85″ tall this is not your standard sized door! It will be a sliding door that provides privacy between the kitchen/dining area and the living/entry area of his house. Looking at my drawing I’m beginning to wonder if it would be better to increase the bottom wooden panel by 5″ or so so the division isn’t so symmetrical — appreciate any comments from my woodworking readers. In any case, I picked up about 30 board feet of 6/4 Cherry from Woodworkers Source here in Phoenix. 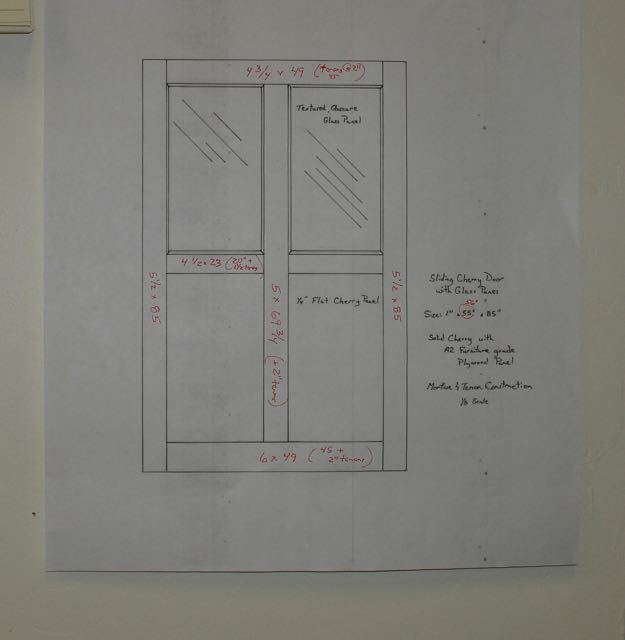 For the size of this door 4/4 stock that’ll finish out at perhaps 3/4″ wouldn’t be right, unfortunately going to the 6/4 to get a full 1″ thickness is wasteful and adds expense to the project. It used to be fairly common to find 5/4 stock but now even 6/4 is difficult to find, lucky for me Woodworkers Source had a great selection of it and I came home with enough 10′ long boards that were around 6″ wide to do this project. I have them do the straight line rip for me, 10′ boards and a #7 Stanley jointer plane is possible but in keeping with the hybrid woodworking philosophy they can sweeten one edge for me! Once they were in my shop the first step was to carefully layout the the boards and cut to rough length. This began with checking (and double checking) the plan and is done with chalk. Since they will all be surfaced the finish size and use for each board is written on the end with a black sharpie. I need all the hints I can think of to keep myself straight! The pictures above are kind of a before and after representation of the days work. The process is to first sweeten up the edge that had been straight line ripped with the #7 Stanley Jointer plane; I love this tool! It probably dates to the 1920’s and originally had a Sweetheart Laminated blade which I’ve replaced with a blade and chip breaker from Hock tools. With its’ corrugated sole and a little bit of beeswax and it’s smooth sailing! There were two boards that had a bit of twist to them which was taken care of with a scrub plane, you can get the view of the over the winding sticks in this picture. Once all the boards had a working edge and were flattened they were all run through the planer to 1″ thickness. Boards were then ripped to the required width and the second edge is planed to remove the marks left by the tablesaw. With boards that were over 7′ in length planing from both ends was needed one some to follow the grain direction but all doable. Here’s a little montage of that process, hand planing is such a relaxing process — the turmoil of the world gets relieved shaving by shaving! For this project I’ve decided to use a different type of finish recently written up in Fine Woodworking Magazine. It’s called Osmo Polyx Hard Oil and the distributor was good enough to send me a sample of it. After experimenting on a piece of Alder I’m really liking the finish. As some of you may know, the finish I’ve used since the 70’s is one I learned about at San Francisco State from Art Espenet Carpenter. Basically it was Watco Danish Oil and then a 3 part mixture that was wet sanded into the wood. Watco has changed drastically over the years (not for the better!) to meet EPA requirements and just isn’t the same — so, this old dog is trying to learn a new trick. Now that the wood is prepped the next step is the joinery. All mortise and tenons, 2″ long for strength. Since the door is over 7′ tall I need to get a 10′ piece of 3/4″ black pipe and pony clamps. I had several 10′ lengths of pipe but when we moved here from Las Vegas a year ago decided they weren’t worth the weight or hassle of moving so sold them at our garage sale — off to Home Depot! This entry was posted in Hand Tool Woodworking, Hybrid Woodworking and tagged Art Espenet Carpenter, Corrugated sole Jointer, Hock Plane Blades, Hock Tools, Osmo Polyx, Scrub Plane, Sliding Door, Stanley #7, Watco Oil, Woodworkers Source. Bookmark the permalink. I used black pipe to try and clamp up a queen sized bed headboard and footboard. I got lots of flexing and bending with them as pressure was applied. Where I would have used one clamp, I had to use two. Yep, not as rigid as my ancient 6′ Pony I- beam clamps but need 7’+ to clamp up that center rail to top and bottom. For final glue up the two 6 footers top and bottom with the pipe in the center. Wish me luck! Quite a large door! It should be impressive. You wondered about increasing the lower panel dimension. Since I always like as much light as possible, I don´t think I would; it will make the lights smaller. Instead, how about adding a bit more “weight” to the lower rail? Could you make it 7″? BTW, how is it going to slide? That might be more “fun” than any other aspect?! ?